INOUE KUNISADA: KO-ITAME, OSAKA Steel. with TOBI, and TORAN-MIDARE with ASHI. Profuse NIE. OSAKA BOSHI (MARU) and OSAKA YAKIDASHI. 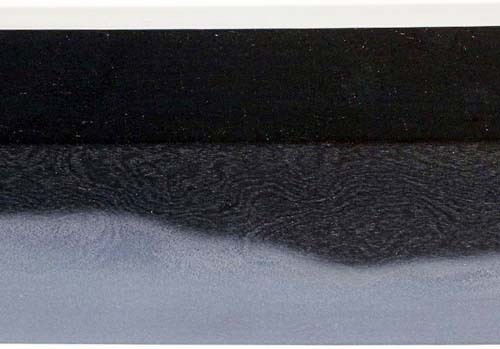 Shinogi-Tsukuri, Ihori-Mune, wide MiHaba, of shallow curve with O-Kissaki. Omote has Kurikara and Vajra Ken in a frame and Ura with Bonji and KoshiHi-ni-SoBi. Standing Itame Hada has pronounced Chikei. Notare Gunome mix of profuse Nie with Sunagashi and Kinsuji. Notare Komi Boshi where Omote has Hakikake at the head and Kaen to Ura. Ubu Nakago with one Mekugi-ana and Haagari Kurijiri. Very subtly narrowing to the lower Ha. 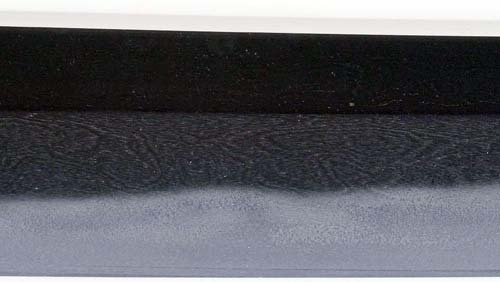 Deeply curved Hira-Tsukuri, Ihori-Mune, thick blade with wide Mihaba. Kurikara and Vajra Ken Horimono on Omote and Bonji with Koshihi-ni-Sobi on Ura that runs into the Nakago. Standing Itame Hada with Mokume mix. Nie-Deki Notare Gunome is mixed together. Sunagashi streams through and Ashi-iri falls. Notare-Komi Boshi has Tsuki-age in the mid resolving to long Kaeri. Ubu, Kurijiri Nakago has two Mekugi-ana.Subtle narrowing to lower Ha. Omote Kiriba, Ura Hira-Tsukuri wide-bodied, deeply curved, Mitsu-mune Dambira. 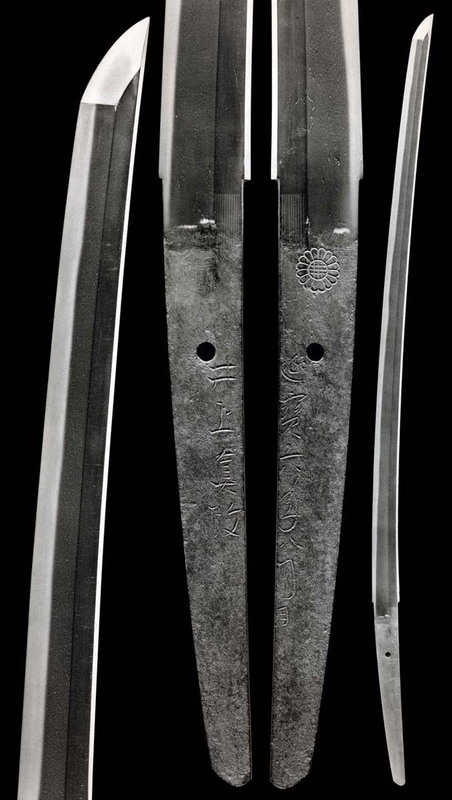 Omote Kurikara and Vajra Ken in a frame and Bonji above Gomabashi twin grooves on Ura. Strongly standing Itame has O-Hada and profuse Ji-Nie. Notare Gunome mix of Nie with Ashi-iri and Sunagashi running. Omote-Boshi is Midare-Komi with Ko-Maru to deep Kaeri and Ura-Boshi with Notare-Komi to Tsuki-age and deep fall. Ubu, Kurijiri Nakago has one Mekugi-ana. Subtle narrowing to lower Ha. Hira-Tsukuri Ihori-mune elongated Dambira Sugata. Itame with Mokume has profuse Ji-Nie and Chikei. Nie Gunome mixes with Saka Choji. Ashi, Kinsuji and Sunagashi pull at figures.The Hamon widens in the upper where Sunagashi and Ara-Nie bring Kuzure Ba into the mid. Saagari Ko-Maru and long Kaeri. Ubu, Kurijiri Nakago has one Mekugi-ana. Shinogi-Tsukuri Ihori-mune, Shinogi-taka (raised), Chu-Kissaki.. Standing and running Ko-Itame Mokume mix, with Ji-Nie and Chikei, and Yubashiri. Ko-Choji, Gunome Togari Ba with Ashi and Yo, in Nie and Nioi. Kinsuji and striating Sunagashi creates Nijuba and Hotsure. Boshi is Chu-Sugu Hakikake with deep kaeri and Mune-Yaki. Ubu, Kurijiri Nakago has one Mekugi-ana. Signed in Grass-style. Standing and knit Ko-Itame Ko-Mokume has Ji-Nie. Billowing Soshu-style Nie and Nioi O-Midare Gunome-Midare Ba. Mumei Suriage Kirijiri has one Mekugi-ana. Shinogi-Tsukuri, Ihori-Mune, shallow curve to Chu-Kissaki. Tightly knit Itame Hada has Ji-Nie. Chu-Suguha has long and serene Asaki-Notare undulations of Nie and Nioi-Fukashi. Sunagashi brushes the Habuchi where Kinsuji finds play. O-Maru Boshi with long Kaeri. Ubu Haagari Nakago fattens very subtly on the lower Ha. Kesho Yasuri. One Mekugi-ana. KUNZAN Homma,formost authority on the Japanese sword of the last century, states that the "tremendous [nuance] or exceptional power of this sword shows (Shinkai's) fully completed seating as a master. While we see the influence of his teacher, Horikawa Kunihiro, this sword exhibits strong differences from Kunihiro's ordinary Sugata: CHU-KISSAKI and having YAKIDASHI, rounded and spire GUNOME and KO-MARU-BOSHI. We see a starkly superior accomplishment in CHIKEI and unusally strong KINSUJI - this, at the same time of his master. This is more an expression of MASAMUNE or NORISHIGE." SHINOGI-TSUKURI, IHORI-MUNE, slightly short with comparatively high SORI. NAKA-MINE (CHU-KISSAKI). KITAE: ITAME flows. JI-NIE is thick and bright and CHIKEI is mixed in. HAMON: GUNOME and CHOJI mixed in a slight NOTARE; and has ASHI and YO. Deep NIOI and NIE abounds. There is SUNAGASHI and KINSUJI. BOSHI: Slight MIDARE-KOMI, HAKIKAKE returns long and wild. NAKAGO: UBU, UE-KURI JIRI on top/ wide YASURIME cross each other, one MEKUGI-ANA. 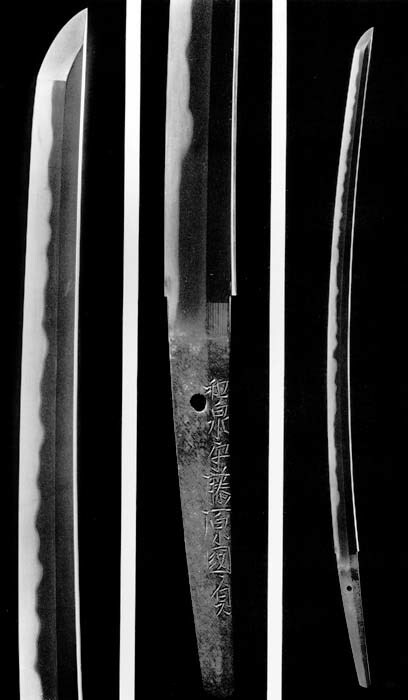 Seven letters as "IZUMI-NO-KAMI - FUJIWARA KUNISADA"
The smaller blade has the particularly prominent JI and HA that shows the superior and known technique of this smith (2nd Kunisada/Shinkai). KUNISADA was the youngest student of HORIKAWA KUNIHIRO. After KUNIHIRO's death, he moved to OSAKA and is known as the pioneer of OSAKA smiths. Of the numbers of OSAKA swords, his are most. We see DAI-SAKU among these. 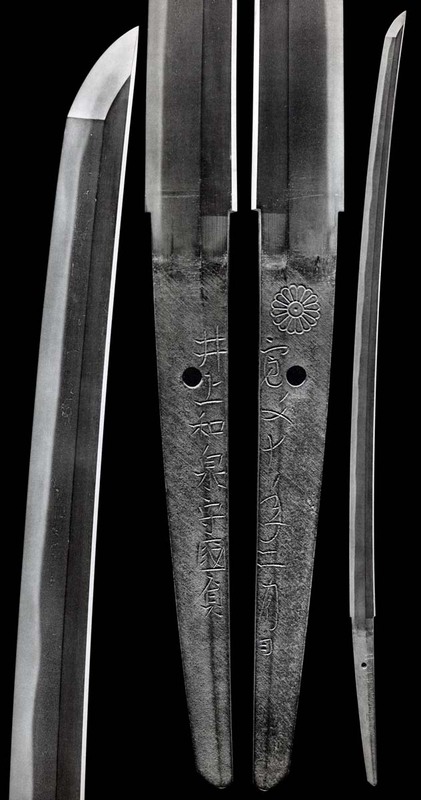 Peculiar to these DAI-SAKU, the first three characters: "IZUMI-NO-KAMI" are made small, as compared to the last four characters: "FUJIWARA KUNISADA." This circumstance is specific to DAI-SAKU of the KAN-EI KU (Kan-ei 9 - 1632) time period. This sword is DAI-SAKU of the 2nd Generation KUNISADA (Shinkai). Shinogi-Tsukuri, Ihori-Mune, very shallow Sori to Chu-Kissaki. Nioi-Fukashi of Suguha of Asaki-Notare with Nie, sweeping Sunagashi and Kinsuji pulling Nijuba into the Hamon. Notare Saagari Boshi has Ko-Maru on Omote and O-Maru on Ura to an abrupt Kaeri. Ubu, Haagari Nakakgo has one Mekugi-ana. Subtle widening in the lower Ha. 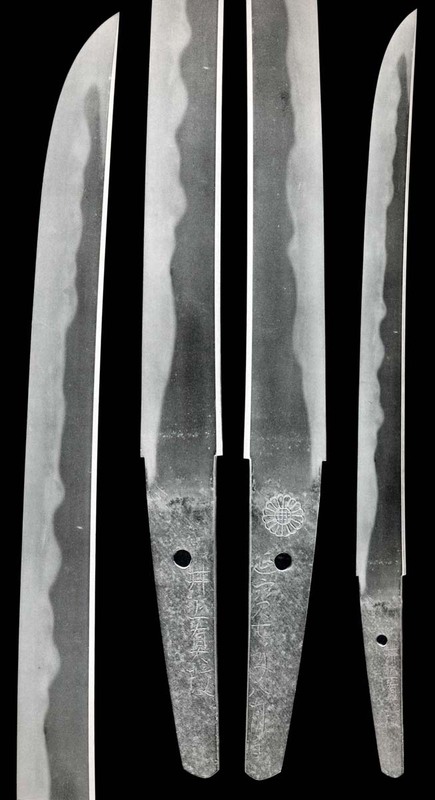 Hira-Tsukuri, Ihori-Mune, slight Sori, wide blade with a tapering toward the upper. Asaki-Notare holds Gunome-Midare Ba with Ashi and Sunagashi that pushes Hotsure through the Habuchi. Nioi is serene. Midare-Komi Boshi has a Jizo-like KoMaru and long falling Kaeri. Ubu, haagri nakago has one Mekugi-ana and subtle fullness in width. Shinogi-Tsukuri, Ihori-Mune, slight Sori to Chu-Kissaki. Ko-Itame Hada is unusually tight. There is Ji-Nie and Chikei. Chu-Suguha has very slight almost dreamy Asaki-Notare undulations. Nie in Nioi-Fukashi that is serene. Sugu Ko-Maru Boshi has a medium Kaeri. Ubu Nakago, one Mekugi-ana. Haagari, fullness to the Ha. Strong Mokume with O-Hada Hada. There is Ji-Nie, Chikei and Yubashiri. Notare holds complex Midare and Gunome-Midare of Nioi and Ko-Nie Fukashi and Kuzure in the Habuchi, where vivid Kinsuji fights with Sunagashi. Chu-Sugu Ko-Maru Boshi has Hakikake. Suriage Nakago with two Mekugi-ana. Shinogi-Tsukuri, Ihori-Mune, broad and thick-bodied to Chu-Kissaki. Strong Itame Hada. There is Ji-Nie. 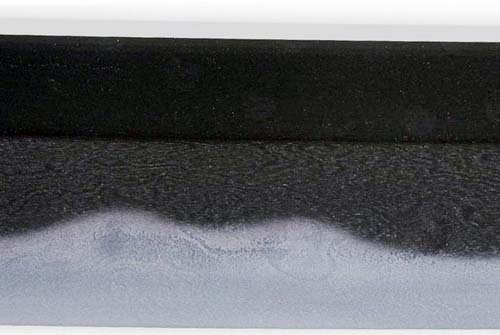 Midare, Gunome-Midare mix in clear Nioi-Fukashi and profuse Mura-Nie. Nioi-Kuzure in Sunagashi and Kinsuji that creates Nijuba. Kakikake and Kinsuji Boshi with long fall. Ubu, Kurijiri Nakago with two Mekugi-ana.